Daniel Fellows cries in court as he is sentenced for hitting a school bus of children while drunk. 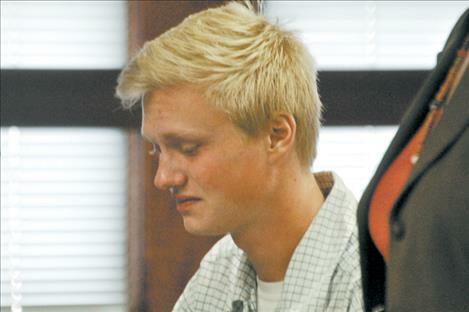 RONAN — A Bigfork teen sobbed and thanked the judge for giving him a second chance after he was sentenced for hitting a Polson school bus filled with 10 children and one driver in May. 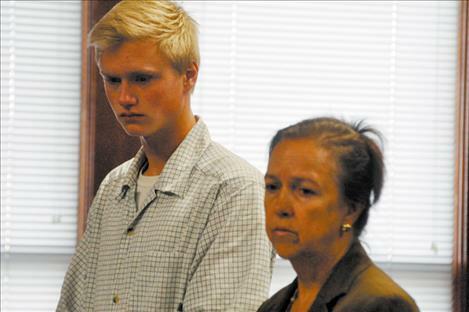 On July 22, Daniel Fellows, 19, after previously pleading guilty to two counts of felony criminal endangerment and a misdemeanor DUI, received two six-year deferred sentences and six months in Lake County Jail, with all but 10 days suspended. He will also have to serve 100 hours of community service, after parents of the children who were hit by the bus requested it. Manley said he would have liked to have set a net jail sentence for Fellows that was 30 days, but because it was the man’s first offense and there was no prior criminal history, he would accept the plea bargain as presented, with the addition of community service requirements. Manley said the incident seemed to be an “aberrational event” not characteristic of Fellows’ character, and noted that if Fellows breaks any conditions of his sentencing agreement then the teen will face up to 20 years in Montana State Prison. Two parents testified prior to sentencing and described the emotional turmoil they went through on May 11, when the bus was rear-ended on Highway 35 while it was stopped and a student was exiting its doors. Fellows was driving 78 miles per hour and had a blood alcohol concentration of .112. The legal limit is .08. A caller to Lake County Dispatch reported that Fellows had missed another school bus a few minutes prior to the crash. Parent John Mausshardt, father of 8-year-old twin boys who were on the bus, told the court about how terrifying it was to get the call that the bus had been hit. Mausshardt said he saw the bus at the scene and later at the impound yard. “All we could think of is that it was unbelievable that no one was killed,” Mausshardt said of the truck and bus’s crushed metal. Mausshardt said he didn’t want Fellows to go to jail for years, but that he would like to see the teen write letters of apology to those on the bus and the other bus that Fellows almost hit. He also suggested community service be imposed, and for Fellows to have to serve 30 days in the county jail. Parent Francine Pierre also said she didn’t want Fellows to be behind bars for years, but that she wanted Fellows to understand the gravity of his actions. Manley wanted to attach some sort of requirement for restitution during the sentencing, but a concrete number is required for that to happen and Fellows’s insurance company expects it will take a year before that estimate is available. Fellow’s attorney said his coverage should cover up to $360,000 of the cost of replacing the school bus. The bus was totaled and the district had to rent a bus for the remainder of the school year.